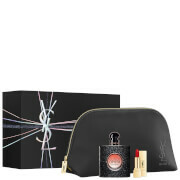 Discover your beauty essentials with the Yves Saint Laurent Touche Éclat Must Have Gift Set. The bestselling concealer is teamed with a mascara and lipstick to create a classic and effortless makeup look. Use the cleanser to achieve a refreshed and clarified complexion. Enhance your complexion with a multi-purpose highlighter that offers buildable sheer to medium coverage. Described as 'eight hours of beauty sleep in a click', the formula can be used to conceal, highlight and contour; it expertly camouflages the appearance of dark circles and uses light-reflecting pigments to blur the look of wrinkles around the eyes. Create intense results with a false lash effect formula loaded with blacker-than-black mineral pigments that create a striking, dramatically dark look. The brand’s signature Triple-Film Complex works to intensely condition, define and lengthen for long-lasting results; a blend of natural extracts and waxes help to strengthen each lash from root to tip in order to prevent damage and fallout. Saturate your lips in shining, vibrant colour with a creamy lipstick that offers each complexion a uniquely customised look. The deeply moisturising formula smooths on effortlessly to deliver medium to full coverage that sticks around for up to six hours and is packed with natural extracts and SPF15 for all-day hydration and protection against damage. Experience a gentle yet effective cleanse with a mild bi-phase formula that has been specially formulated to comfortably remove makeup from the delicate eye and lip areas. Eliminating even stubborn waterproof mascaras and long-wearing lip colours, the gentle cleanser expertly removes makeup while respecting skin to leave it feeling comfortable and refreshed. Touche Eclat: Auf die ungeschminkte Haut oder über die Touche Éclat Foundation auftragen, dann mit den Fingerspitzen oder einem Pinsel verblenden, um sofortige Strahlkraft und einen frischen, strahlenden Make-Up-Look zu erhalten. Bei der ersten Anwendung deines Touche Éclat-Stifts musst du bis zu 20-mal auf den Stift drücken, damit das Produkt durchkommen kann. Mascara: Zuerst in der Mitte der Wimpern und dann auf die inneren und äußeren Wimpern auftragen. Den Vorgang beim anderen Auge wiederholen, ohne den Pinsel ein zweites Mal einzutauchen. Für ein optimales Auftragen dieser Mascara empfiehlt Yves Saint Laurent, die Bürste einmal wöchentlich mit einem trockenen Tuch zu reinigen. Lippenstift: Zum Auftragen des Rouge Pur Couture in der Mitte der Lippe beginnen und bis zu den Mundwinkeln hin streichen. Dann in die umgekehrte Richtung streichen, um maximale Farbtiefe zu erzielen. Reiniger: Vor Gebrauch gut schütteln. Auf Wattepads geben und sanft über das Gesicht streichen. Touche Eclat: Aqua / Water, Cyclopentasiloxane, Talc, Glycerin, Paraffinum Liquidum / Mineral Oil, Dimethicone, Propanediol, Pentylene Glycol, Lauryl Peg-9 Polydimethylsiloxyethyl Dimethicone, Silica, Dimethicone/Peg-10/15 Crosspolymer, Sodium Chloride, Caprylyl Glycol, Lauryl Peg/Ppg-18/18 Methicone, Propylene Glycol, Tocopheryl Acetate, Disteardimonium Hectorite, Tetrasodium Edta, Triethoxycaprylylsilane, Alumina, Lauroyl Lysine, Propylene Carbonate, Isostearyl Alcohol, Titanium Dioxide, Silica Silylate, Dodecene, Poloxamer 407, Dipropylene Glycol, Phenoxyethanol, Biosaccharide Gum-1, Calendula Officinalis Flower Extract, Ruscus Aculeatus Root Extract, Sodium Citrate, Tocopherol, [+/- May Contain: Ci 77891 / Titanium Dioxide, Ci 77491, Ci 77492, Ci 77499 / Iron Oxides, Ci 77163 / Bismuth Oxychloride, Mica], (F.I.L, B197049/1). Lipstick: G908558 Propylene Glycol Dibenzoate, Octyldodecanol, Stearyl/Ppg-3 Myristyl Ether Dimer Dilinoleate, Pentaerythrityl Tetraisostearate, Neopentyl Glycol Diheptanoate, Bis-Diglyceryl Polyacyladipate-2, Polyethylene, Polybutene, Hydrogenated Coco-Glycerides, Candelilla Cera / Candelilla Wax, Cera Microcristallina / Microcrystalline Wax, Alumina, Synthetic Fluorphlogopite, Silica Silylate, Pentaerythrityl Tetra-Di-T-Butyl Hydroxyhydrocinnamate, Magnesium Silicate, Silica, Calcium Sodium Borosilicate, Colophonium / Rosin, Aluminum Hydroxide, Calcium Aluminum Borosilicate, Tin Oxide, Parfum / Fragrance, [+/- May Contain Mica, Ci 77891 / Titanium Dioxide, Ci 45410 / Red 28 Lake, Ci 77491, Ci 77492, Ci 77499 / Iron Oxides, Ci 15850 / Red 7, Ci 15985 / Yellow 6 Lake, Ci 15850 / Red 6, Ci 15850 / Red 7 Lake, Ci 45380 / Red 22 Lake, Ci 19140 / Yellow 5 Lake, Ci 77742 / Manganese Violet, Ci 77120 / Barium Sulfate, Ci 17200 / Red 33 Lake, Ci 42090 / Blue 1 Lake, Ci 75470 / Carmine, ] Fil B191084/1.